Last fall I set out to do what many told me could not be done in our climate. I wanted to plant fall garlic and harvest it this summer. 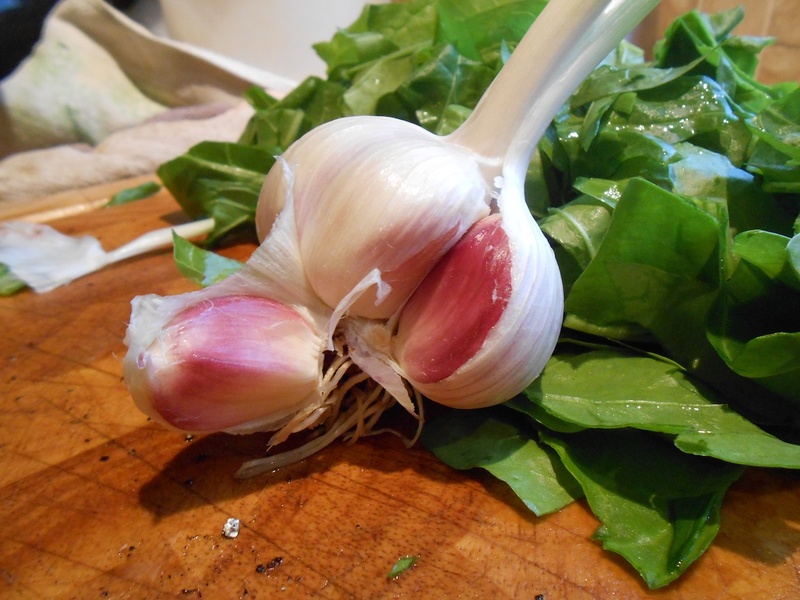 I ordered my seed garlic from my dad who owns an organic farm in Creston, BC. He grows amazing delicious varieties, my favorite being Red Russian, Baba Franchuck and German Red. I chose to plant Baba Franchuck and Red Russian because they have big bulbs with strong flavor. I chose 3 different planting sites. Eight cloves were planted in my south facing 4 foot by 4 foot garden bed which is a raised 8 inch deep cedar box. The soil is a 3 part mix of compost, vermiculite and peat. Twenty-one cloves were planted out at a friend’s place in a new garden patch with very hard sandy soil and four cloves were planted in my flower bed at the north end of our lot. I was advised to mulch the garlic to protect it from our harsh winters so I mulched all 3 locations with a thick layer of dead leaves. In my raised beds I then laid a fleece blanket on top of the mulch and then threw a straw bale on top of the blanket. I wanted to protect the garlic in the raised bed with more warmth as heat is lost through the sides of the box. I used the blanket as a barrier between the mulch and the straw because straw can sometimes contain mites that are harmful to garlic. The garlic was planted on Oct 21 and I noticed the first signs of life in mid-April. By April 30th half of all the cloves planted had emerged from the cool soil. The sprouts in the raised beds grew the fastest, next the garlic out at my friends place and my cloves in the back yard lagged behind. It appeared that the hotspots made a big difference in the width and height of the sprouts. Eventually all but one clove sprouted. What some said would not work, had worked! I was pleased but also realistic, thinking back to the extremely warm weather we experienced over the winter with temperatures rarely reaching -15C with the exception of one week of -30C . In mid-July, I returned from a trip to my Dad’s farm to find all the garlic in each location had produced curling scapes. 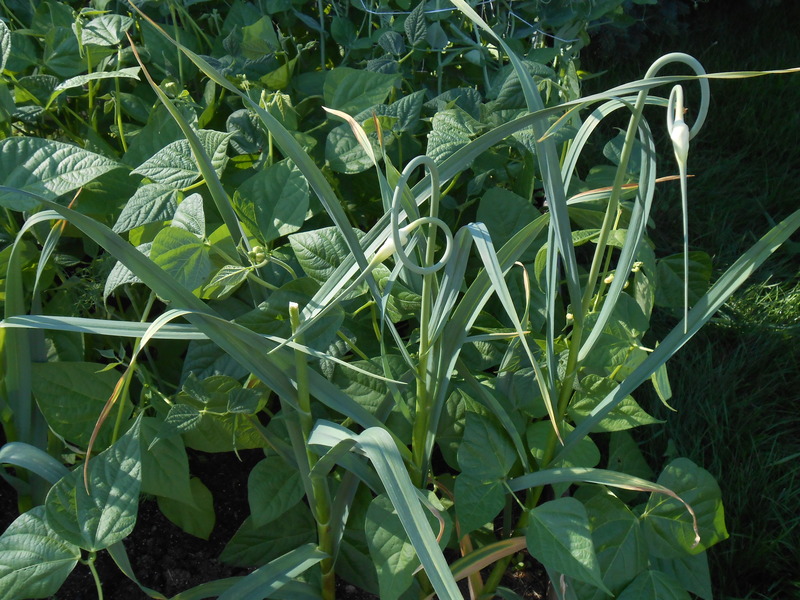 Scapes are the beginnings of the flowering stalk. They need to be cut off once they curl to promote growth to the bulb. My next job was to find out when to harvest. 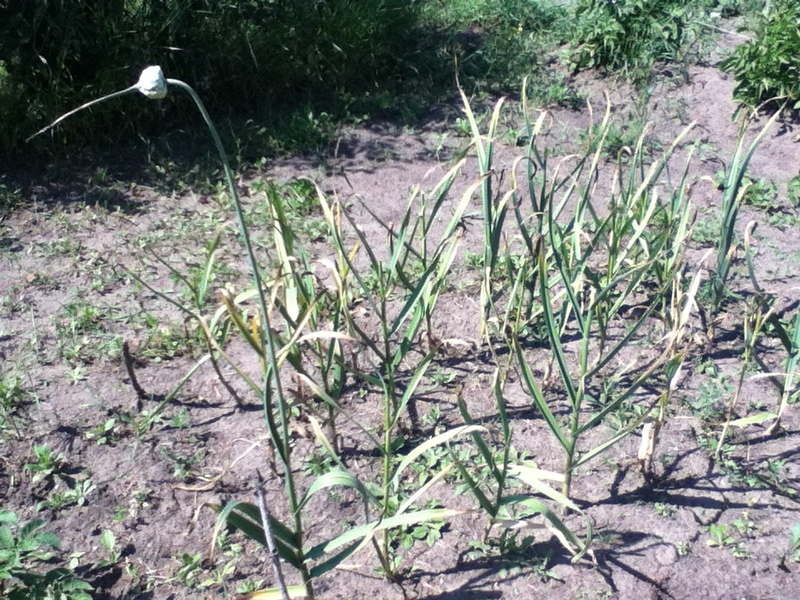 As a general rule, garlic can be harvested 9 months from the date you planted it. That put me at the end of July. Dad advised to start looking for yellow fronds. When all but 2 fronds are yellow it is usually a good sign that your garlic is ready. Another way to find garlic maturity is to leave one scape on your bulb. The scape starts out curly and will eventually straighten out. When your scape has straightened out, your garlic is ready. At 9 months from planting I wanted to check the garlic before I dug up everything so I plucked a bulb to see if each individual clove had produced its own skin or wrapper. It had not yet fully produced the wrapper so it was not yet time to start drying all my bulbs. I left the garlic in the ground for another 2 weeks. I found it was more like ten months from time of planting before the cloves had fully matured. After pulling the garlic from the ground, make sure you dry it properly. Hang the bulbs by their stalks until the stalks are completely dried. This could take up to a month. Drying is important if you want to use your product throughout the winter. Well dried bulbs can last up to 9 months in a cool garage or basement. 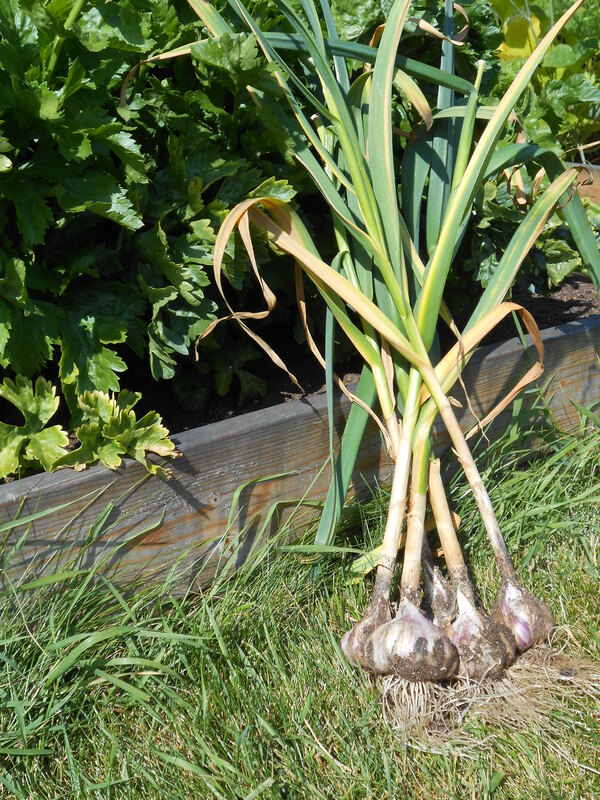 Hang garlic away from direct sun, preferably in a place where it will get some air movement. Planting garlic worked well for me this year. We had very mild winter temperatures and a wonderful, hot growing season. The cloves in the raised beds were the largest. The cloves in the sandy soil did well but were not as big. The smallest cloves were from my north facing flower bed. I will definitely try planting again this fall, this time using seed from my own harvest. I am also going to collect new seed from the single plant I left behind to flower. I would recommend trying a small patch in your own garden as the product is well worth the effort!